It is a “plug-&-play” 3-axis stabilised camera head, and will take up to 35mm cameras (eg Arri 235, 435 etc). This has been used on the front & back of motorbikes, 30m telescopic vertical masts, and is best suited for shots not requiring more than about +/-45º tilt from horizontal. It also has the option of wireless control. 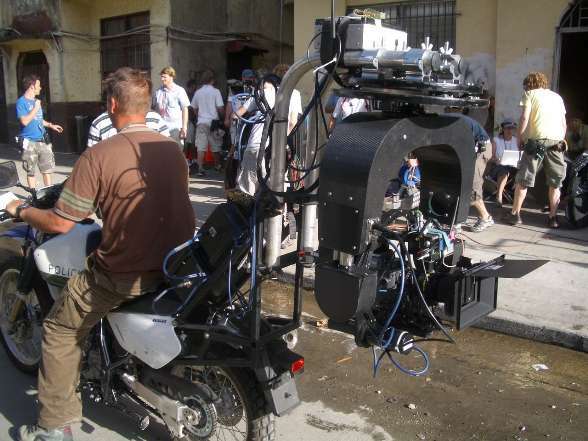 The Bike Head was primarily developed for Bourne Ultimatum for filming a motorbike chase - with the camera mounted over the front wheel of the camera bike.